Florentine biscuits are traditional biscuits made with nuts, candied peel and dried fruits. 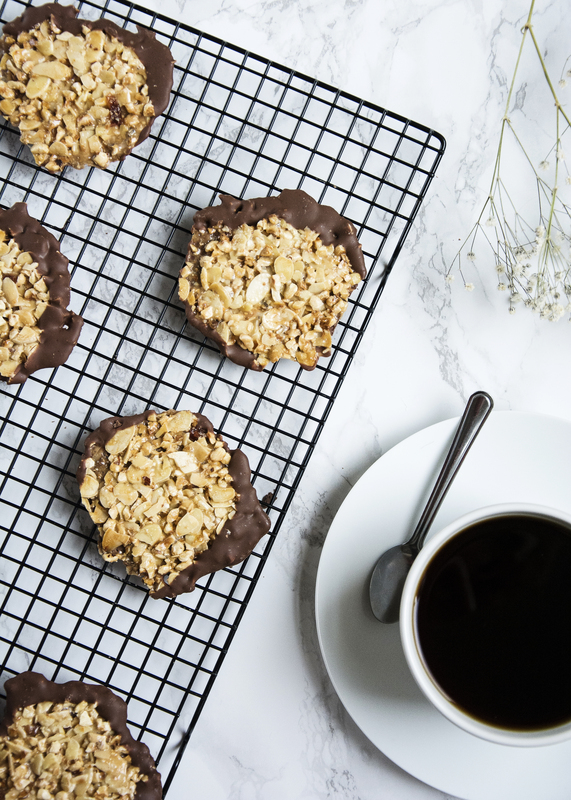 Florentines are traditionally made with dried fruit, nuts and candied peel. I leave out the candied peel in mine as it is hard to find and I don’t particularly care for it. With this recipe you can really make it your own. Glacier cherries go well with florentines, any kind of nuts that you like, pumpkins seeds and poppy seeds are also a great addition. I don’t know the origin of the Florentine but it seems to me that it is the kind of recipe that you just throw in whatever is in your cupboard. So have fun with it and make it your own. Pre-heat your oven to 180C. Line 2 baking trays with baking paper and spray with non stick spray. Place the butter, sugar and golden syrup into a small pan and heat gently until the butter has fully melted. Stirring regularly to ensure the sugar doesn’t begin to burn and stick to your pan. In a bowl combine the flour, ginger, nuts and cranberries. Pour this mix into the saucepan of melted butter and stir well to combine. Using a teaspoon, spoon the mix onto the prepared baking trays and spread out with the back of the teaspoon. If this is proving little tricky fill a cup with boiling water and have an extra hot spoon on the side to help you spread the mix out more easily. Leave at least 3cm around each for the florentines to spread further. Bake for 8-10 minutes until golden brown turning the trays half way to ensure an even bake. 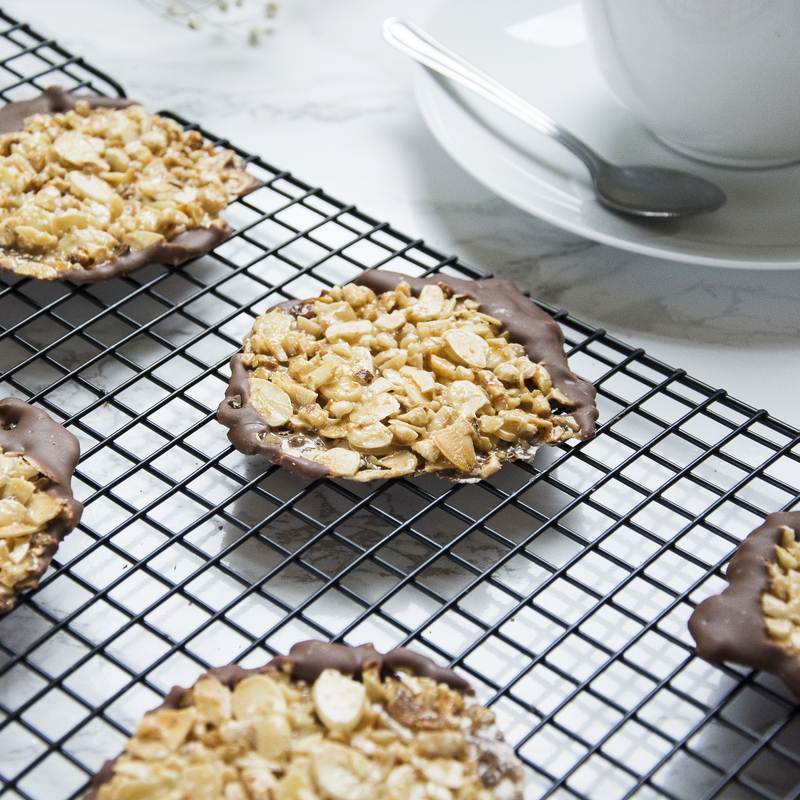 Allow the florentines to cool fully either on a tray or a cooling rack. In the microwave melt the chocolate in 30 second bursts stirring well in-between until completely melted. Either use the back of a spoon to spread the chocolate on to the bottom of each Florentine or if you don’t mind messy fingers dip them straight into the chocolate. Leave to cool in the fridge until the chocolate has hardened before serving. 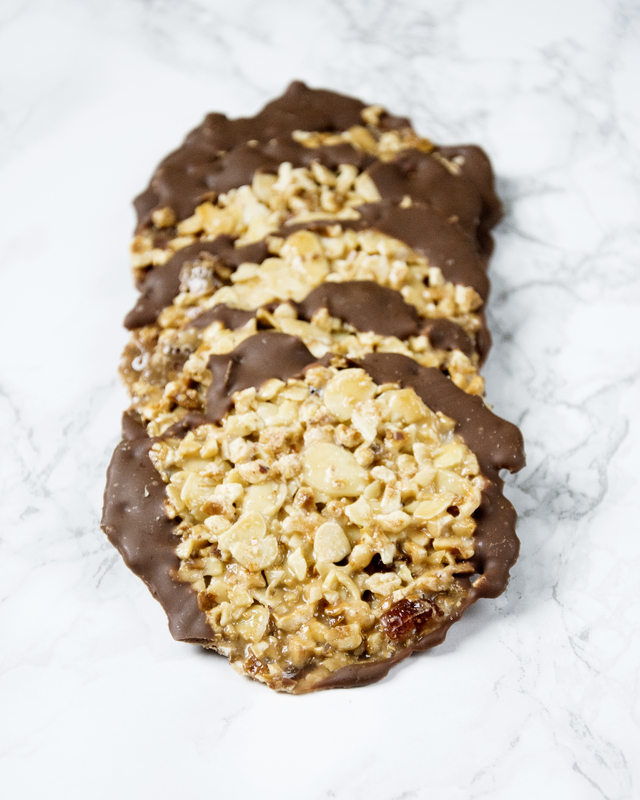 And there you have it, if you give these florentines a go let me know how it goes by tagging @whatseatingmanchester in your social media post.